Noise Damping Compound – Reduce structure-borne vibration & noise. Noise Damping Compound is a water based visco-elastic damping compound that reduces structure-borne vibration in a variety of materials. By imparting vibration damping and a shift in the dominant frequency, the resulting noise reduction provides a means of improving the noise transmission loss in many applications. Noise Damping Compound also improves the fatigue life of treated surfaces and is typically used in new construction and equipment requiring damping treatment plus superior flame spread and smoke density ratings. Damping Compound comes in a neutral color, is paintable and is available with an anti-static additive. It meets FMVSS 302 and is ideal for use in bus, rail, and marine applications. It is typically used in fan and blower housings, ductwork, bins, chutes, hoppers, machine guards, and stadium seating. Noise Damping Compound is an extensional damper, which means it is applied to the surface that must be damped. It can be applied with a sprayer, trowel, or paintbrush, as long as it covers the surface of the substrate and adheres well. The amount of damping is achieved depends on the ratio of thickness of the damping material to that of the substrate. Generally, a ratio of 1 to 1 of 2 to 1 of damping compound to substrate is recommended. Keep in mind that damping increases approximately in proportion to the square of the thickness ratio. All Noise Control’s damping products have high-energy dissipation resulting in the suppression of vibration and its accompanying noise. Additionally, damping products reduce vibrational transfer to adjoining structures, increases the metals working life, and delays the onset of fatigue. Need adhesives? 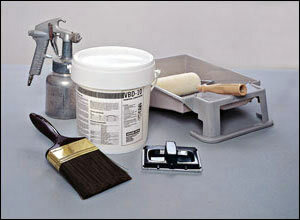 Please see our all purpose construction adhesive page. Need technical assistance? Contact us here….